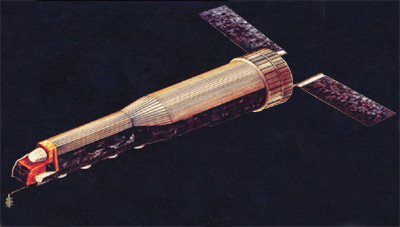 KH-9 (Keyhole-9), also known as Hexagon or inofficially as "Big Bird", was a large reconnaissance satellite to replace the earlier KH-4B Corona satellites. In contrast to earlier models, it was not based on the Agena stage, but on a new maneuverable bus called SCS (Satellite Control Section). It featured four return capsules for a much increased lifetime. 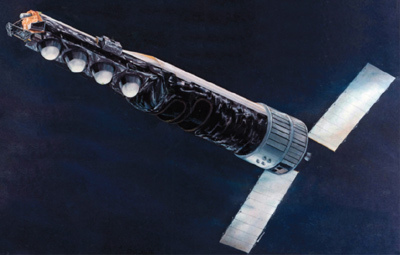 The McDonnell Douglas manufactured Mk.8 return capsules were of a similar type as in the earlier Corona satellites and were designed to deorbit a film capsule from space with mid-air recovery of the returning capsule by a specially equipped aircraft. The camera system was built by Perkin-Elmer and consisted of two large panoramic cameras for area surveillance with a forward looking camera on the port side, and an aft looking camera on the starboard side. Images were taken at altitudes ranging from 90 to 200 miles. The camera optical layout is an f/3.0 folded Wright Camera, with a focal length of 1.5 m. The system aperture is defined by a 0.51 m diameter aspheric corrector plate, which corrects the spherical aberration of the Wright design. In each of the cameras the ground image passes through the corrector plate to a 45° angle flat mirror, which reflects the light to a 0.91 m diameter concave main mirror. The main mirror directs the light through an opening in the flat mirror and through a four-element lens system onto the film platen. The cameras could scan contiguous areas up to 120° wide, and achieved a ground resolution better than 0.61 m during the later phase of the project. 12 of the 20 satellites featured also a mapping Camera System (MCS) mounted on the forward end with an own smaller Mk.5 return capsule. It was present on missions KH-9 5 to KH-9 16. The mapping camera or "frame camera" used 9 inch film and had a moderately low resolution of initially 9 m, which improved to 6 m on later missions. Intended for mapmaking, photos this camera took cover essentially the entire Earth with at least some images between 1973 and 1980. Missions 1205 to 1207 carried Doppler beacons to map the atmospheric density at high altitudes in an effort to understand the effect on ephemeris predictions. The measurements of the atmospheric density were released through NASA. The lifetime of the satellites increased from 40 days in the beginning to up to 275 days during the final missions. KH-9 17 (Hexagon 17, Mission 1217, OPS 5642) 1982-041A 11.05.1982 Va SLC-4E Titan-3D with Farrah 1 ? KH-9 19 (Hexagon 19, Mission 1219, USA 2) 1984-065A 25.06.1984 Va SLC-4E Titan-34D with Farrah 2 ?